Tired of seized or failed electric or hydraulic drum brakes? 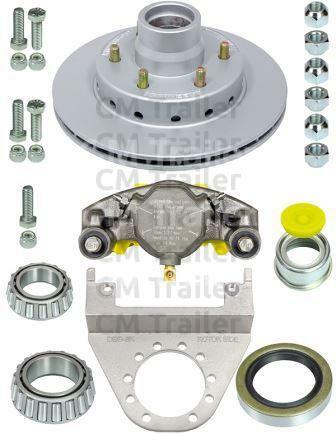 Now there is an easy solution with Retro Disc Brake Kits that fit a lot of USA made trailers and are easy to install. 6 year warranty on stainless steel, 2 year warranty on all other parts. All calipers are individually tested to ensure years of quality service, even in heavy salt water conditions. These calipers are the first to feature all corrosion resistant hardware including; stainless steel guide bolts and guide bolt sleeves, brass hardware on bleeders and inlet fittings.